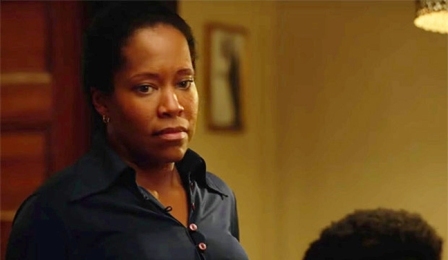 Regina King makes it easy to say “yes” to an assignment editor’s request for a reporter to join in on a national conference call and listen to an actress talk about her role in a movie. I had already sounded the “y” in my “yes” before the sentence conveying the opportunity was complete. At 7 p.m. Central time last Wednesday, I was in full-listen mode as King – fresh from her Golden-Globe winning evening – talked about her role in “If Beale Street Could Talk” with more than a thousand faith leaders, community activists, sororities and fraternities and African-American news outlets on the line. She was candid from the jump. One key story King is telling is this: Go the see the movie; help get the word out! Let people know that there is a powerful film out about a “black family in the early ‘70s” and how they manage to get through the challenges of life in a world of institutions that are systemically and historically racist. It resonates with themes of family, love and justice. “Beale Street” made its American debut on December 14 in – get this – just four theatres. That’s right, four. All four, however, were overrun with sold-out audiences, lines wrapped around the block, people seeing it for the first time, fans coming to watch for the fifth time. It’s the little movie that could. Hundreds of Facebook posts, tweets on Twitter and other social media messages lit up cyberspace during the call as people live-streamed King’s interview and reported that they had already seen “Beale Street” multiple times. King portrays Sharon Rivers, Ernestine and Tish’s mother and Joseph’s wife. The facts of her own journey suggests that King has been preparing for the role all of her life. Director Barry Jenkins adapted a screenplay from Baldwin’s book and then set course for a movie on the big screen. Produced by Plan B Entertainment, the film made its world premiere at the Toronto International Film Festival on September 9, 2018. King racked up a Golden Globe award as “The Best Supporting Actress.” In her acceptance, she thanked Jenkins for telling the poignant story. She vowed as a producer and director, herself, to make sure all her future projects involve at least 50 percent women. The tone for the movie was set at the top, King said on the call. “Barry from the very beginning created a loving and trusting environment. From that day when the cast first met, we fell into our roles. It was like our roles chose us. Sharon and Joseph Rivers create a loving, nurturing household, King said. April Reign, the activist who started “#OscarsSoWhite,” also praised the film on the 45-minute conference call.